Enter your Assembla username, password, workspace, server, and host. Note: Do not enter the path to your workspace, only the name of your workspace. Select Connect and the status should change to "Connected"
Where Can I Find my Assembla Server & Host? 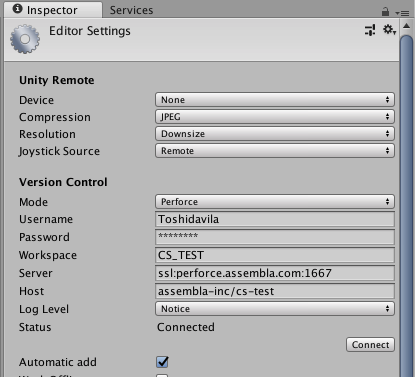 In the Assembla WebApp, open your Perforce repository and select the Instructions sub-tab. This page will show you important information that you will need to configure your depot with Assembla.